Bridgestone National Convention (March, 400 pax), or the Vinitech-Sifel fair with 850 exhibitors and 45,000 attendees at the Exhibition Center in November 2018 are among the most important events held in the city in 2018. Since its opening in 2016, the Cité du Vin registers more and more corporate event requests. It is a successful example of a leisure equipment that has been adapted to corporate events with integrated spaces. The venue welcomed 440 private events in 2018, offering unique experiences to a nearly 31,000 participants such as the privatization of the Belvedere, permanent exhibition or tasting workshops. 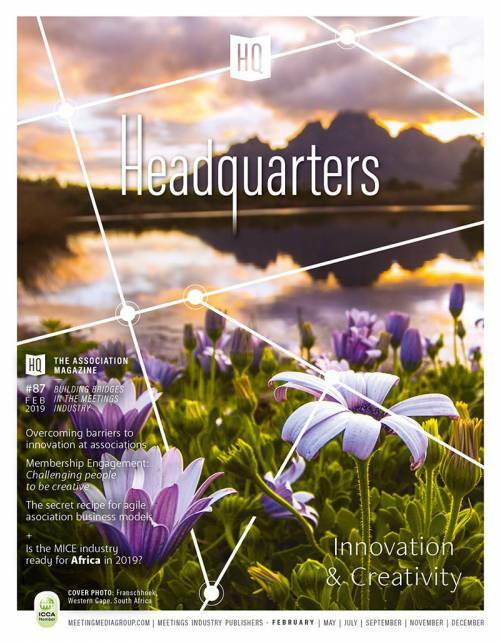 The Bordeaux Convention Bureau actually manages 105 congress applications (until 2027), including for example the OHBM Congress (Organization for Human Brain Mapping, with 3,500 pax in May 2022). These applications represent a total of 357,000 congress days and more than 103.5 million euros in potential economic benefits. 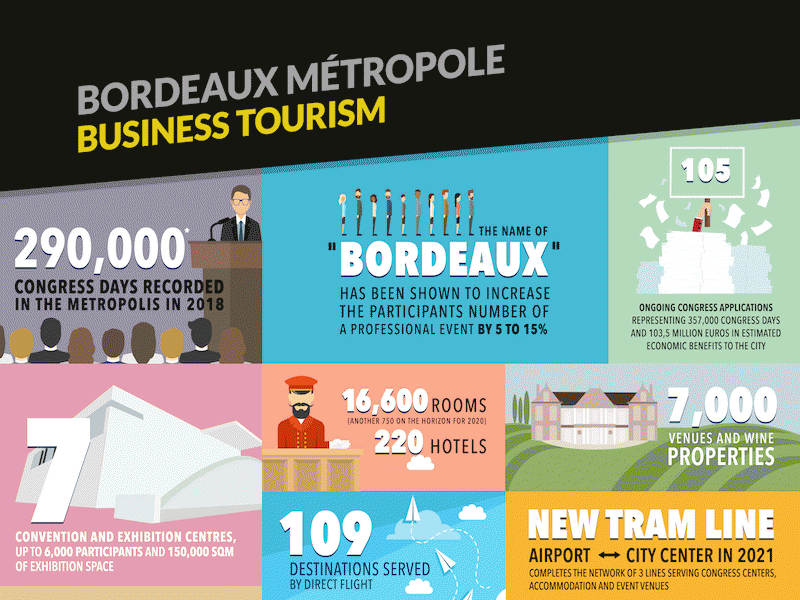 86 corporate events followed by the BCB in 2018 will be held in Bordeaux in the next 5 years, representing 120,000 congress days and 35 million euros in estimated economic benefits to the city. The new Exhibition Hall, the Palais 2 l’Atlantique, will welcome most of them, increasing our global seating capacity to 6,000 pax (2nd largest Exhibition Center in France outside Paris). VINEXPOfair will be the first event hosted there in May with 2,300 exhibitors and 45,000 professionals. Major congresses will follow with SAE Aerotech (1,800 pax in September 2019), the Accountants National Congress (4,000 pax in October 2020), the RoboCup, robotic world championship (4,000 pax in June 2020) and ICIP (optic & laser, 1,700 pax in September 2022). The Bordeaux Convention Bureau launches mid-year an observatory dedicated to corporate tourism. It will give an overview of the attractiveness of Bordeaux Metropole for professional events in the last years. It will list the events organised by companies, unquantified so far compared with the congresses. This observatory will allow to anticipate variations in our activity and to take actions up to the scale of the metropole. It will also help to compare Bordeaux corporate activity with other destinations. 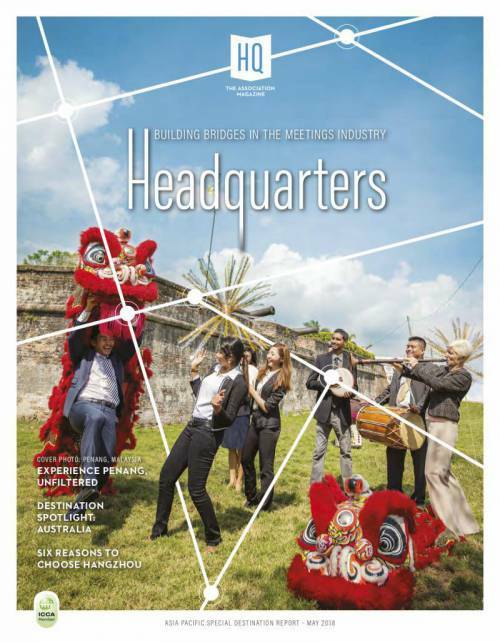 More than 40 corporate tourism key actors in the metropole are involved: congress centers, accomodation, venues, PCOs, the hospital centre, the CNRS, Bordeaux University, Darwin, Matmut Atlantic Stadium. Sector: corporate/non-corporate → If the organizer is a company, it belongs to the corporate sector; if it is an association, a federation, a union, etc., it belongs to the congress or non-corporate sector. New institutions in the metropole are now built in a way that corporate events can be hosted: stunning private area at Bordeaux Natural History Museum, organization of exhibition visits and activities at the MECA (brand-new exhibition space dedicated to creative economy and culture) and an entire floor dedicated to corporate events at the Musée Mer Marine (Museum of the Sea and the Navy). The city also counts new facilities dedicated to corporate tourism, such as the new Exhibition and Congress Hall, the Palais 2 l’Atlantique, opening in May 2019. In 2021, a new Congress Center with a capacity of 300 participants will be unveiled in Euratlantique, a new economic neighbourhood next to the train station. *A congress day is calculated by the number of participants to an event multiplicated by the number of days of the event. ** The estimated economic benefits are calculated according to the study published by the Paris Chamber of Commerce and Industry in December 2012 "Étude sur les retombées économiques de l’activité des congrès en France et en Île-de-France" in partnership with key actors of the sector. The study determines the average expenses per delegate and the related organizational expenses based on 18 in-depth and representative surveys and the interview of 3,200 participants.